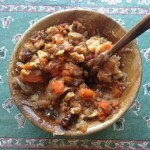 This breakfast porridge can be made with any combination of root veggies. Play around and see what you like the best! Using a large saucepan, put water on to simmer and cover it as you chop your veggies. Chop the veggies thinly in this order: burdock, carrot, parsnip, onion, and place them in the pot as you go, adjusting the burner to keep it at a good simmer. After all the veggies are in, add the spices. Simmer until soft—45 min or so. Then mash with potato masher or fork.